Thanks to our presenters, Paul Evans (host), Paul Hvass, Matt Robinson, Min Ling Chan, Dave Coleman, and Mirko Bordignon for an informative session on ROS-Industrial projects seeking community involvement. This web meeting, held on 16 May 2017, is the second Global ROS-I Community Web Meeting. Scroll down below the video for abstracts. Paul Evans (ROS-Industrial Americas and SwRI): Welcome and review of the agenda. The Global Community Web Meeting focused on open source projects seeking broader community participation. Paul Hvass (PlusOne Robotics): Outgoing ROS-I Americas Program Manager message to the community and introduction of incoming ROS-I Americas Program Manager. Matt Robinson (Transitioning to ROS-Industrial/SwRI): Incoming ROS-I Americas Program Manager greeting to the community. 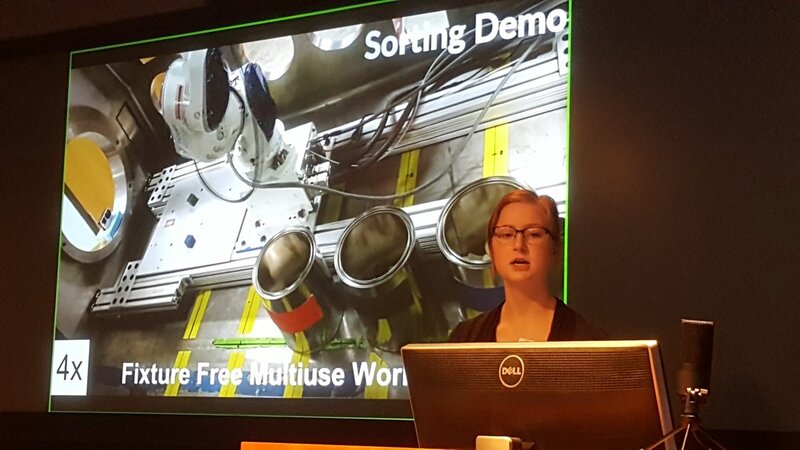 Highlighted a PackML (Packaging Machine Language) project focused on creating an ability to run ROS across multiple OEM PLCs for manufacturing plants for communication between PLCs, increased interoperability, modularity, and efficiency. Proposed is a new Business Analytics Dashboard to provide users an intuitive display of the real-time root cause analysis and OEE. Presented a project to create a graphical user interface for the industrial calibration package with preset configurations for the most common calibration cases to simplify the calibration process. Introduced the MoveIt! Code Sprint focused on integrating existing academic motion planners into MoveIt! that have the potential to improve cycle time, optimize existing planners, and systematically compare performance for industrial use cases. Provided an overview of the new ROSIN European initiative. ROSIN was launched to bring ROS to the factory floor with a focus on improving software quality. Included is a targeted investment for ROS-Industrial Focused Technical Projects. Educational activities are included as a key component of the initiative to support wider adoption.